Congratulations to Elise Hernandez, the 2016 Ad Pro of the Year. The Ad Pro of the Year award recognizes one individual that brings unmatched value to AAF Lincoln and the Lincoln marketing community, contributing extraordinary work both on- and off-the-clock. The award is given to someone who has been in the advertising industry for more than five years. Elise has been an AAF Lincoln board member since 2014 and currently serves as Treasurer and Public Service chair. She is a 2010 graduate of UNL's College of Journalism and Mass Communications where she was an AAF-L Scholarship Recipient and was selected for the 2010 Class of AAF Most Promising Multicultural Students. 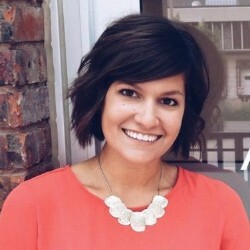 Elise currently works as a Brand Manager / Digital Strategist at Agent, an advertising agency in Lincoln's Haymarket. In her role on the board, Elise worked with ​students at ​Jacht Ad Lab, UNL's student-​run​ advertising agency, to develop pro-bono advertising campaigns for ​each annual public service recipient, including Bright Lights in 2014-15 and Men With Dreams in 2015-16. Elise also led the committee that organized and hosted AAF-L's first annual AdWars event in ​2016.